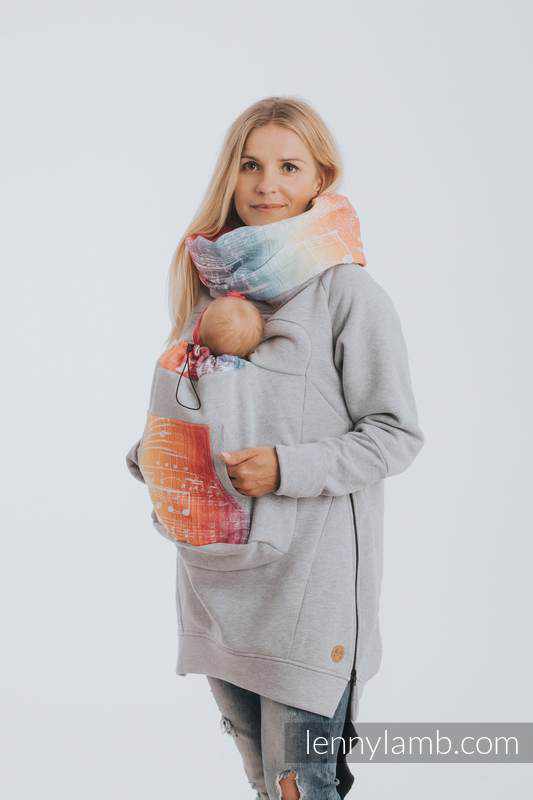 This soft, warm babywearing sweatshirt with gorgeous wrap scrap accents keeps both you and baby warm while using a baby carrier in cold weather. THIS IS A PRE-ORDER. Listed as back-ordered because when you pay for a sweatshirt, I will order it for you. Your sweatshirt should arrive in 2-3 weeks with FREE US Shipping. can be used over most any soft baby carrierRuns Small. SIZE UP ONE SIZE. 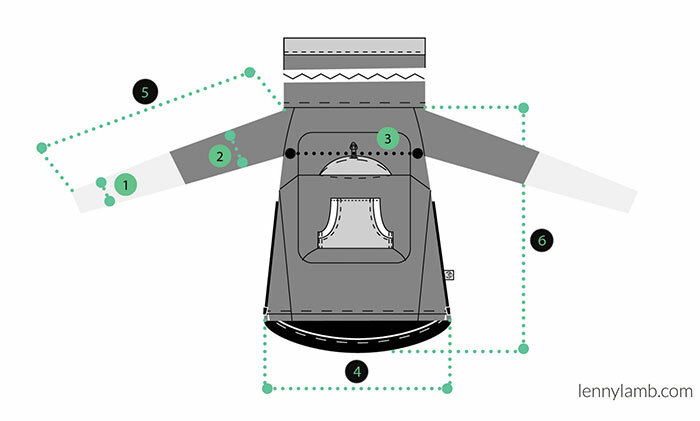 Detailed measurements below. SKU: N/A. Categories: Babywearing Coats and Outerwear, Best Sellers, Lenny Lamb Baby Carriers, Woven Wrap Gifts and Accessories. New for 2018, the Lenny Lamb babywearing sweatshirt is soft, warm knit fabric. 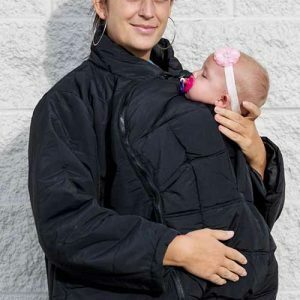 Easily slip the hoodie over you and baby in a front or a back carry. It is not a baby carrier but is used over a safe baby carrier. 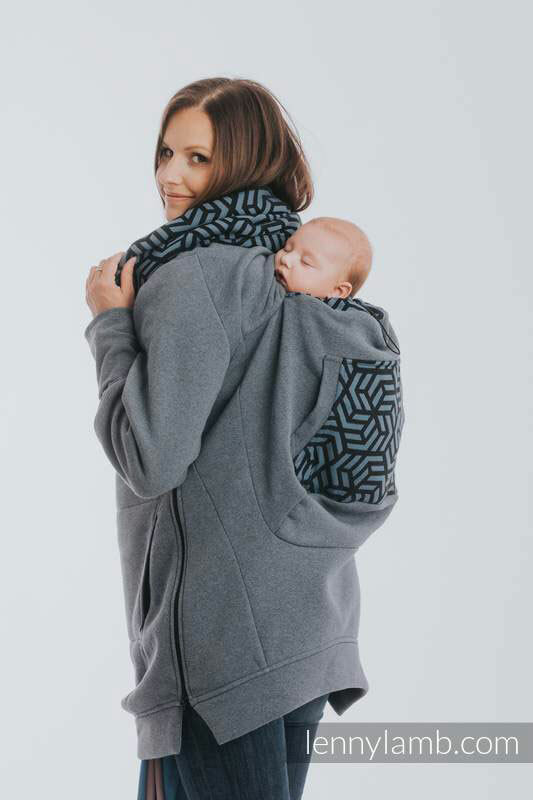 You will stay warm all season with baby in an upright position on your chest or back! 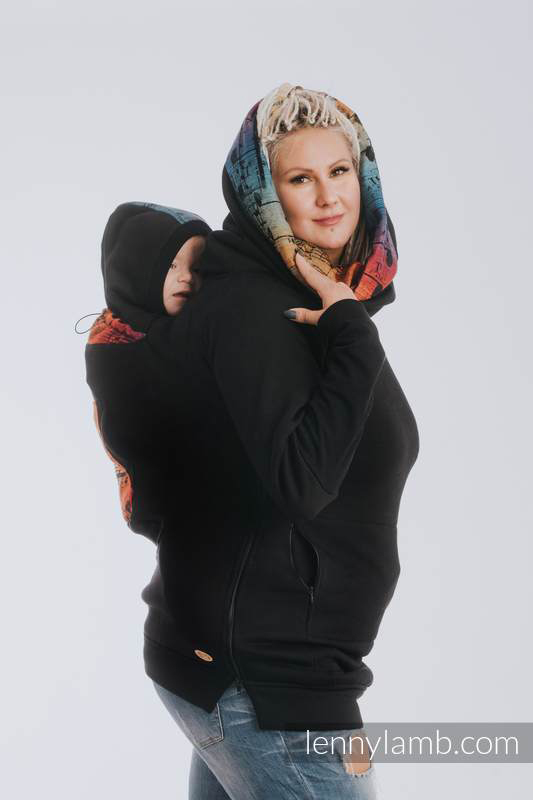 This babywearing hoodie works with most soft carriers whether wraps, ring slings, buckle carriers, etc. Works with small babies or toddlers. Gender neutral so it can be used by men or women. Size UP ONE SIZE. 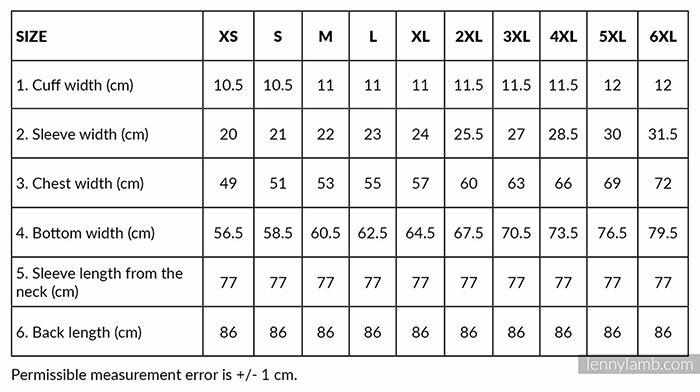 Scroll down for sizing info from Size small to Size 6X. The beautiful accents on the Lenny Lamb Babywearing Sweatshirt are made from their beautifully woven wrap fabric. If you want to get a wrap or carrier that matches your sweatshirt, let me know at diana@wrapyourbaby.com! 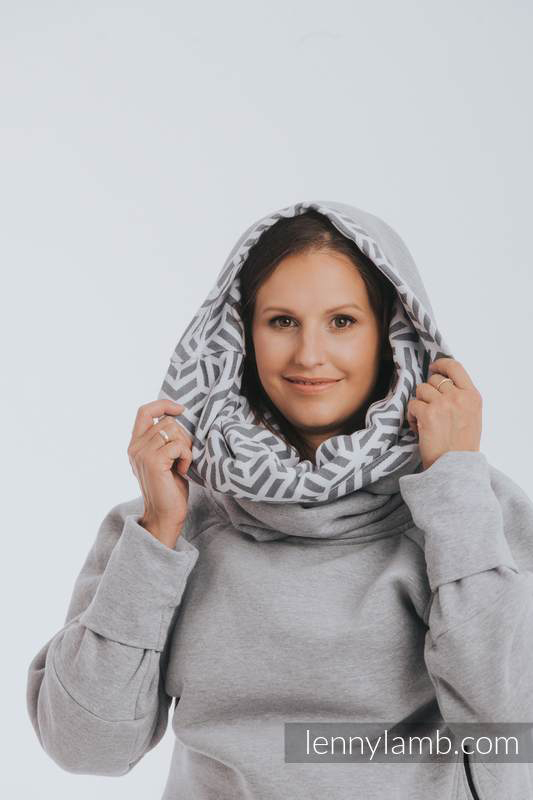 THE SNOOD – The wrap fabric snood adds both fashion and function as it is designed to be used as a warm hood for you with your baby in a front or back carry. The ingenious design allows you to use it as a hood in either position. Or leave it bunched for style and keep your neck warm on chilly days! 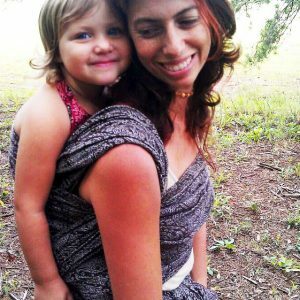 POCKETS – The beautiful wrap fabric panel over baby also provides pockets for you when you use the babywearing sweatshirt over a front carry. Additional discreet pockets are found on the back of the sweatshirt so you can keep your hands warm in a back carry, too. 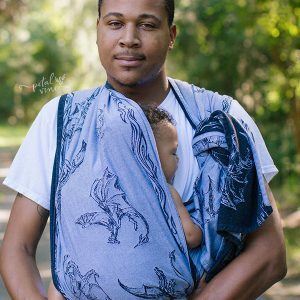 First put your baby in a safe baby carrier high on your chest. Here’s how to use a long wrap for a front carry. Now put the sweatshirt on over your head just like a regular hoodie. The wrap fabric panel should be in the front so it goes over baby. Slip baby’s head through the head hole and then poke your own head through the top. Bunch the really long fabric of the snood around your neck attractively. Here’s Lenny Lamb’s video for putting a sweatshirt on over a front carry. 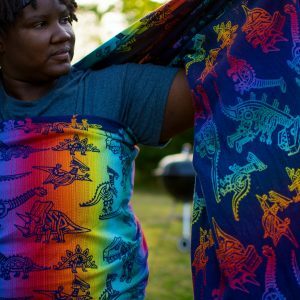 This video uses their old, discontinued fleece design but it is similar enough to see how you can do it in the new improved version. NOTE: Your 2018 version babywearing hoodie will have a zipper on each side. Unzip before putting it on to make it even easier to get over you both. Zip them up after you get it on. If you want to use the hood, pull up the back of your snood to cover your head. 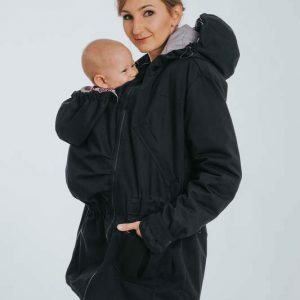 Use the pocket openings in the wrap fabric panel over baby to keep your hands warm, just like with a traditional hoodie. When using it over a back carry, just put the sweatshirt on backwards so the panel is in the back. Pull the sweatshirt down so baby’s head pops out the head hole. Then work your own head out through the snood. The ingenious snood design works perfectly as your hood when worn backwards as well as forward. 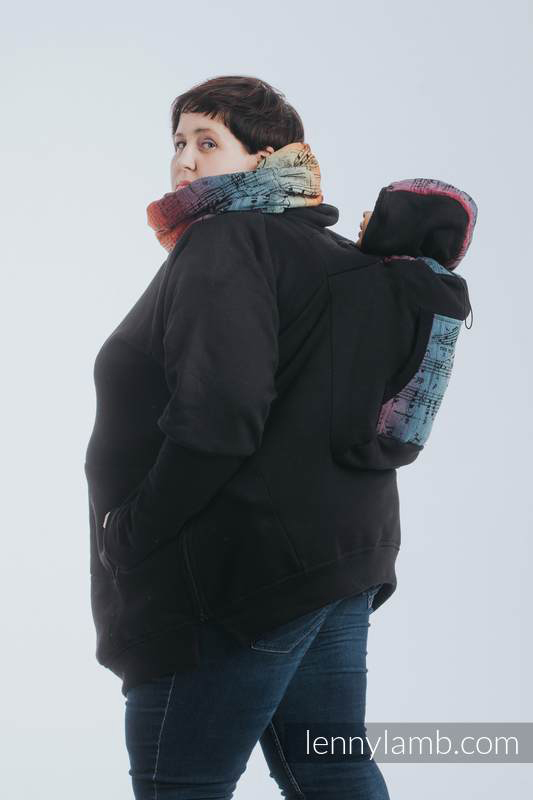 While the wrap fabric pocket is over baby on your back, you will find additional pockets on the sides of the sweatshirt for use when using it in a back carry. Here’s Lenny Lamb’s video for putting a sweatshirt on over a back carry. This video uses their old, discontinued design but it is similar enough to see how you can do it in the new improved version. Your sweatshirt will have a zipper on each side. Unzip before putting it on to make it even easier to get over you both. Zip them up after you get it on. 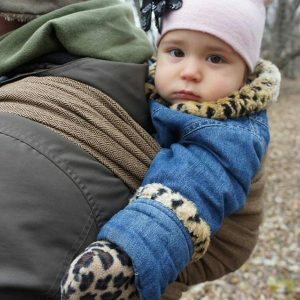 Is the Babywearing Sweatshirt/Hoodie for you? If you are an active parent, if you go for lots of walks and outings with a baby, this is for you. 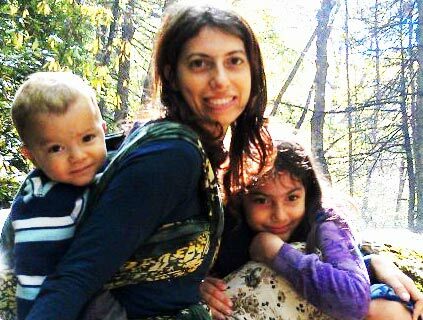 The Lenny Lamb Babywearing Hoodie is an invaluable piece of clothing during all family adventures. 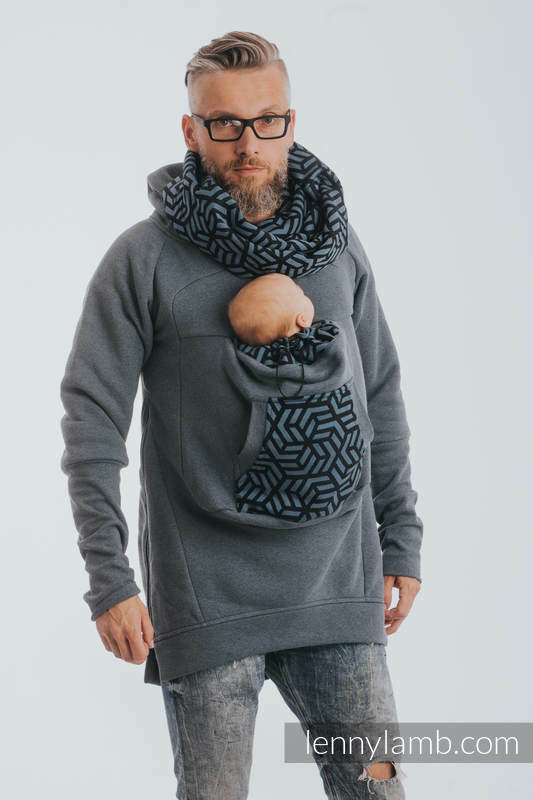 The design of the 2018 Lenny Lamb Babywearing Sweatshirt is universal – perfect for both men and women. There are nine sizes available: S, M, L, XL, 2X, 3X, 4X, 5X and 6X. These are a size small compared to US women’s sizing. Consider sizing up one size from the size you would usually wear. IMPORTANT: This Sweatshirt is not a product that carries the baby’s weight. 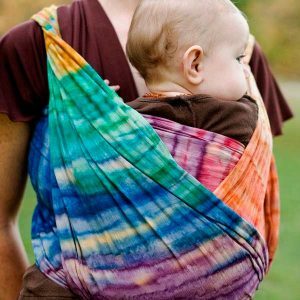 Use it over your baby who is already in a woven wrap or other baby carrier. This sweatshirt is amazing for cold fall and winter days! I like the cowl neck/hood because it removes the need for wearing a scarf but keeps my neck warm. My only complaint is that it runs small but I have a size larger than my usual size and it fits well (I typically wear small and medium is perfect). Extremely warm and great for any caregiver and baby! This is an amazing sweater. My only disappointment was it’s not true to size… 6x is really a 4x so it fits me snug. So if you are a 4x I would DEFINITELY get the 6x. I love the balaclava for baby’s head. It is a beautiful sweatshirt! Super soft, warm and I received tons of compliments when I wear it. My baby is still small (3 mo) and I struggle with how bulky the cowl is. I have a hard time seeing her over the bulk of the folded material. I have the older version without the zipper, but we have figured out how to put it on and off without too much trouble. Haven’t yet tried back-carries with it. I also find myself not wearing it too regularly yet because it doesn’t seem too nursing friendly on the go…but I can see where I would use it a lot when she is older and nursing less frequently. I LOVE this sweater! I suggest sizing up one size. Aside from that it is so cozy, super warm and the large cowl is really nice for our rainy weather because it is large enough to pull over your head. It comfortable covers my Lenny Lamb SSC and my son seems to love how cozy he is in it as well. It’s reletively easy to get off on your own and a breeze to get on. Also, even with their volunteer work lately, Wrap Your Baby got my sweater to me WAY before it quoted to arrive.